Professional planning is commonly defined as an activity which is concerned with the rational allocation or exploitation of resources for man's maximum short- and long-term benefit. The science of. ecology is the study of the basic components of these resources (soil, water, air etc. ) and their inter­ relationships with living organisms. Planning and ecology therefore have many common interests and, as such, have long been associated in resource management. This association was, for example, reflected as early as the 19th century in the writings of Patrick Geddes, the progenitor of modern town planning, whose training as a biologist led him to re-interpret the phenomena of urbanization in ecological terms (Geddes, 1886). 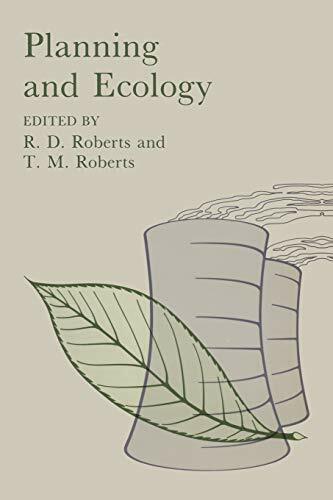 Since the time of Geddes the place of ecology has declined in planning circles as other professions and considerations, initially public health and engineering, latterly economic and sociological, have become more central. The reasons for this shifting emphasis are three-fold. First, they reflect changing social attitudes and aspirations in the post-war period. Secondly, many other professions and persuasions (agriculturalists, foresters, in­ dustrialists etc. ) became organized as pressure groups and helped shape public attitudes and governmental actions. Thirdly, and by far the most important reason, is the prevalence of misconceptions about ecology. Too many people, perhaps misled by the debate surrounding the' environmental movement', equate ecology with conservation. In reality, conservation is but one component part of ecology.